Qv21's advanced e-ticketing, HOS ELD and logistics platform for the transportation of oil, diesel, refined fuel, water, municipal solid waste and other bulk commodities drives down costs and increases profits. The Qv21 platform can help eliminate needless steps, streamline your transportation business and increase your bottom line with one platform. It's available at an affordable price that fits your budget. Qv21 offers FMCSA-certified hardware, an HOS ELD and GPS tracking device, that continuously records hours of service and tracks location. Data is automatically transferred to The LogisticsFramework® (TLF) platform when the driver's in-cab phone or tablet is in-network for dispatch and management to view. No CapEx required for complete ELD compliance--only a monthly subscription. Watch the video to learn more. Qv21 software has been used to dispatch and track almost 10 million loads with The LogisticsFramework® (TLF). Transporters use TLF to unify their business processes and schedule, track, ticket, invoice and report all their loads in one cloud-based system. More than 1.3 billion barrels of crude and water, plus thousands of loads of sand, waste and other commodities have been transported and accounted for with Qv21's TLF e-ticketing and logistics system. With HOS ELD and DVIR tools, field data is available instantly. Dispatch communication with drivers results in efficiencies and reduced costs. The LogisticsNetwork™ (TLN), aggregates the bulk commodity inventory being tracked in TLF into a real-time data portal for carriers, producers and marketers to reconcile volume, resolve disputes, and analyze quality and forecasts. The dispatchers' office can be a hectic, stress-filled environment. It's also the heart of the trucking logistics supply chain. When communications are clear and comprehensive, stress is reduced and a higher degree of efficiency is achieved. Whether you're hauling crude, frac sand, waste or any other bulk commodity, deliveries made with fewer errors result in faster order-to-revenue receipts and AR turnaround. Qv21 software provides complete visibility into fleet operations and enables dispatchers to send and receive information instantly to drivers.The LogisticsFramework® (TLF) gives your dispatchers and drivers tools for real-time information that leads to effective real-time decisions. TLF customers see dramatic improvement in dispatcher efficiency, from 3 to 6 times as many drivers can be managed by a single dispatcher than with other transportation management systems. The TLF ROI calculator provides an estimate of what you can expect as the first year return on investment with Qv21's dispatch, e-ticketing and billing software. Send us a few key facts about your operation, and we will send you a complimentary overview of savings from a typical TLF implementation. Lower cost of unaccounted volume or product loss due to mishandling, accounting/data errors, evaporation, theft, etc. Contact Qv21 for a complimentary customized ROI calculation for implementing The LogisticsFramework® (TLF). Qv21 recognizes that logistics and fleet management operations are mission-critical to the transportation industry. A fragmented system with limited connectivity and little automation results in operating at less than 100% efficiency. Business suffers–sometimes dramatically–and the stakes have never been higher. During our tenure to bring state-of-the-art logistics systems to the marketplace, we have been fortunate to work with many forward-thinking individuals and companies. Those relationships have led to constant improvements in our products, and positioned Qv21 to act as a data hub, which led to the development of The LogisticsNetwork™ (TLN) our newest product. Qv21 aspires not to be just a software company, but a key partner to the industry. The LogisticsNetwork™ (TLN) is a web-based interface where your supply chain partners (carriers, shippers, marketers, buyers and sellers) can view and manage their inventory movements simultaneously. TLN gives carriers and producers an aggregated view of all run tickets in real-time. This centralized data source lets you monitor supply chain partners in a holistic view to reconcile, avoid inconsistencies and bill on time. TLN is a real-time data platform where TLF data feeds are aggregated so producers can understand commodity supply change, monitor volumes and gain visibility to where loads are currently located and where they are going. Validate the data according to predefined criteria (example: max/min volumes, inconsistent temperature or BS&W, shipping to wrong destinations, etc.). Volume discrepancies can be reconciled while there is time to correct them without impacting revenue, plus carrier ticket corrections can be viewed in real time. “The electronic ticketing service that Qv21 provides has been the most cost efficient system implemented to date. When running the cost analysis on what it would take to fully integrate this e-ticketing software, it was shocking to find that such a great service could be provided at such a relatively inexpensive rate. The biggest difference between Qv21 and other e-ticketing software companies is the customer service department. When calling in with technical issues, you actually get a live person answering the phone and don’t wait for a return phone call. James Hammonds (Qv21 Representative) has provided our company with such amazing service that we continually threaten to make him a member of our team. “Qv21 offers a great product. They are always willing to help, and listen to the customer on how to improve the product. 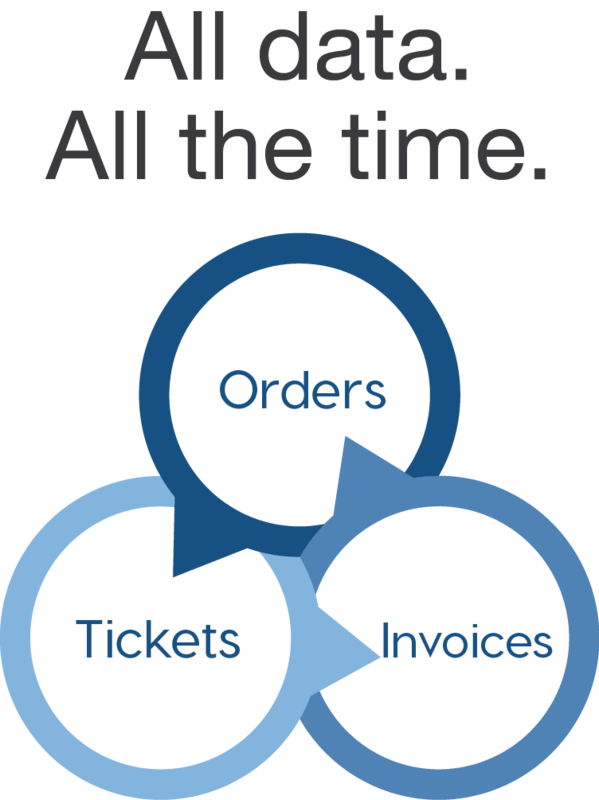 The e-ticketing and invoicing is a great feature to have to be able to be digital and have access to the data without delay. “I have worked with Qv21 for about 4 year and they have been very helpful in correcting any issues I have in a timely manner. "Very Good Company to work with. Great support and good customer relations. Makes ticketing a much easier process." "It’s amazing what great dispatching/billing software will do for a company. The money saved is outstanding. We were able to turn a seven day process into a three day process. Getting money into the drivers hands soaoner rather than later makes a world of difference. Their attitude and morale shot through the roof. Bottom line, Qv21 has put together software that is a one stop shop. From billing to dispatching, data management to invoicing, this software is top of the line."